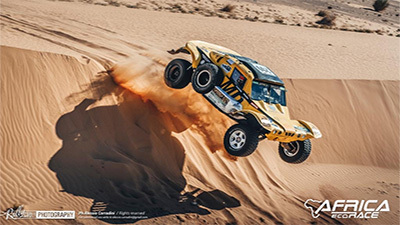 Thursday January 10th 2019: Stage 9 AMODJAR / AMODJAR: 482,82km Liaison: Amodjar / Oued Chinguetti: 38,73km Stage: Oued Chinguetti / Chinguetti: 374,37km Liaison: Chinguetti / Amodjar: 69,72km Considered one of the nicest stage of this 11th edition, the competitors will make the most of the stunning landscapes of the Mauritanian desert. This special sector is familiar to regulars of the AFRICA ECO RACE® as this loop was part of last year’s route also. This time, the stage will be done in the opposite direction. Therefore, it will totally change the experience. The morning liaison towards Chinguetti will be through rocky tracks impossible to race on. A difficult start to the day but after a departure in the Oued Chinguetti, all the rest will be bliss with tracks in the heart of the dunes among mind-blowing panorama. Competitors will have to be tough and clever to face the challenges of the day. With no doubt, one of the most important stages of the race.